Our school is beginning Accelerated Reader. Students will receive a grade at the end of each quarter based on how they did reaching their goal. The grade will be part of their reading grade and will be worth 30 points. Students will have opportunities to take the AR tests at Silent Reading time in our classroom or at lunch recess in the library. I encourage you to visit the Renaissance Home Connect site on a regular basis to see how your child is progressing toward their goal. I will put a link on my Weebly site to access Renaissance Home Connect. I gave each child an AR bookmark with his/her user name, password, and book level to keep in their homework folder. They also have a book log to keep track of books they are ready to test on. I am excited to see how this new program will encourage the love of reading in my students. 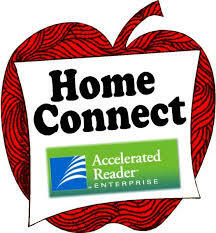 Click on the apple to go to the AR Home Connect page to track your student's progress.